"Santa" always brings me foodie things for the holidays, and this year was no exception. I thought I'd go down the list. "Before Gabrielle Hamilton opened her acclaimed New York restaurant Prune, she spent twenty fierce, hard-living years trying to find purpose and meaning in her life...."
Yeah, despite not staying in the restaurant world, I'm a sucker for a good chef narrative. Past favorites include Heat by Bill Buford, and the classic Kitchen Confidential by Anthony Bourdain. I've been wanting to read this one for a while. Basic reference book for frequent kitchen problems. It seems to have a lot in it addressing infrequently used ingredients and techniques, so I'm going to try using it instead of the internet for a while. I did look up persimmons in it already! While most people will recognize her from TLC's Little People, Big World, the Roloffs went to school with my sister, so my Mom gave Amy's cookbook to all three of us. It seems to have lots of family recipes. I'm hoping for something that seems Oregon related since the Roloffs live close to where I grew up. There are a lot of pictures of the family in it as well. I know this cookbook author best from her vegetarian cookbooks like Passionate Vegetarian. This cookbook isn't entirely vegetarian, but when she includes a recipe that isn't, she always has a vegetarian option. She also clearly marks each recipe and variation if it is vegan or gluten-free. There are lots of good sounding things in here! I already have a bunch marked to try. I've followed Deb's blog for years, and made many of her recipes. They are always well-tested, delicious, and I couldn't wait to get her cookbook. This was a gift from my sister. I haven't cracked it yet because I'm delaying gratification. The cover is gorgeous, and her photography always has been, so this just can't be bad. Not technically a holiday gift, but Nathaniel brought this home from some discount store around the holidays. 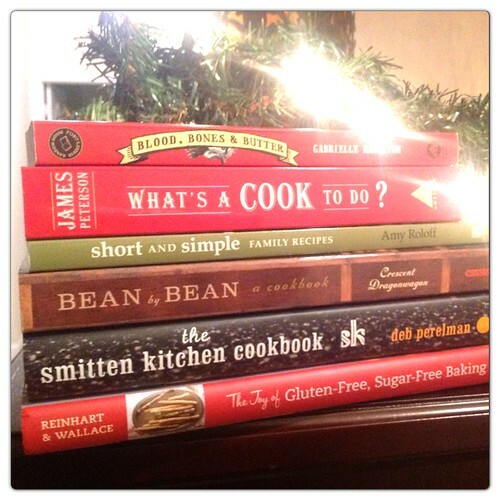 I was skeptical as I have read some really terrible sugar-free and gluten-free cookbooks. Some aren't diabetic-friendly and simply substitute honey, maple syrup, or agave for sugar; some gluten-free cookbooks create their own flour substitute and just use that for everything, rather than varying flavor and texture with flour. This is co-written by one of the bakers I trust the most - Peter Reinhardt, author of the Bread Baker's Apprentice and American Pie, among others. To see the results of his superb baking ability applied to sugar-free and gluten-free baking made me tear up (not joking) because I have a feeling that this will revolutionize my own attempts that I've been making for the last year. THANK YOU, Peter. 7. Cookbook bone (not pictured) - I had to Google this one to figure out what it is. Now you can. Ha! What did Santa bring for you foodie-wise this year? 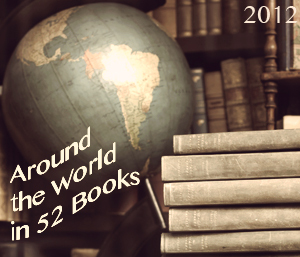 I ended up reading books from 47 countries in 2012, and seem to have acquired at least that many more books. I'll keep exploring the world of books unread and baked goods/desserts unmade. I'll be focusing more of my energy on a similar Around the USA reading challenge in 2013, and you guessed it - I will be attempting to do more regional American baking. Please let me know if you have any favorite regional recipes, because I do not yet have something for each location. I have a good start on my Around the USA Baking board in Pinterest, so check it out and tell me what you think I'm missing. The highlight this year has to be having a croissant from Sarafina's on St. Martin. That is as close as I have come to France so far! I visited a cupcake truck in Dallas and a German bakery in Alabama, but wasn't out seeing a lot of places selling baked goods this year. The next section will explain. I resisted salted caramel. Everyone kept raving about this cake, so I made it for my birthday and it is AMAZING. A must try. Martha, I take back anything bad I ever said about your recipes. Sensing a theme? These made my co-workers very, very happy. 3.Two candies I made during the holidays - Gingerbread Caramels and Microwave Toffee. One was a lot of work, one was super easy. I might repeat both next year. So I end 2012 a convert to caramel, even salted caramel, and lighter on my feet. I'll think for a few days on what I want 2013 to hold in the baking arena, and post again. Happiest of new years to you all! After telling my caramel making woes to enough people, I was told a secret - the Secret of Microwave Toffee. I had no idea you could make toffee in the microwave, and approached the idea with great skepticism. I finally had time to try it tonight, and it is a must-make for the holidays. Super easy, and super delicious. (Thanks, Jane!) I am going to make a few more batches with different nut combinations. I used the recipe from Lesley at Kitchengifts.com, but almost all the recipes I found on the internet were variations of the same formula. I had chopped hazelnuts left over from the big batch we roasted a few weeks ago, so I used those instead of pecans this time around. The other candy displayed on the plate is so simple to make you don't even need a recipe, you just need good ingredients. We had picked up a few of the single-origin bars from Black Mountain Chocolate when they were at the Asheville Tailgate Market. I melted the Peruvian bar in a double boiler, dipped dried apricots in it, and rolled them in chopped pistachios. They have the marvelous combination of sweet/salty/bitter and haven't lasted as long as they should have in our house! 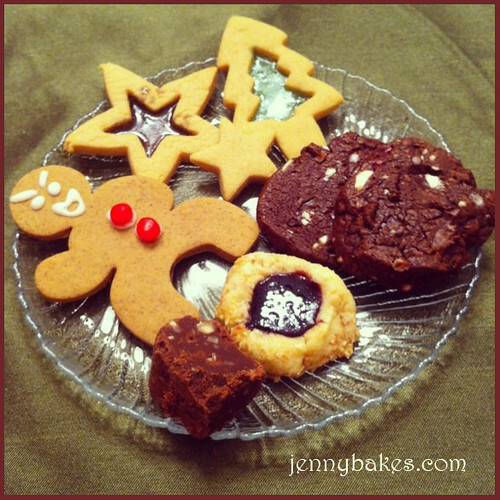 These were my favorites of the cookie baking madness of early December, so much that I made them twice! The first time happened because I picked up a bag of Trader Joe's Peppermint Bark Baking Bits, which is my preferred ingredient. Trader Joe's tends to get seasonal food in one time and then not have it again for a year, so when I went back for more, they were cleaned out. I chopped up a bag of Andes Peppermint Crunch but it wasn't quite the same. Still good. The photo pictures the Andes, with the red and white stripe. I suppose you could make these with crushed up candy canes, but the bark has sweeter white chocolate that adds a lovely texture to the cookies. In the microwave or in a saucepan, melt the butter and chopped chocolate, stirring frequently, over medium heat. Let cool for 15 minutes. Beat the sugar, eggs and vanilla at low speed until smooth, 2 minutes. Mix in the cooled chocolate mixture just until blended. Add the flour mixture gradually. Stir in peppermint bark bits or peppermint crunch pieces. Divide the dough and scrape onto plastic wrap, shaping roughly into logs. Refrigerate the dough for at least 1 hour. Preheat oven to 350 F. Slice 1/4" pieces from log and place 2" apart on a parchment paper lined baking sheet. Bake 10-12 minutes or until set. Full disclosure: The framework for the original chocolate cookie recipe comes from the Rachel Ray recipe for "Hot Cocoa Cookies," but I abandoned that idea and took it in this direction. Every year we have a work holiday party the Friday of final exam week. I usually bring one of the desserts, but never have I been as nervous about what I brought as this year! I wasn't sure the filling was sweet enough. I wasn't sure the balance was right. I almost didn't bring it in at all. In the end, I think it turned out okay. Not overly sweet, but I was hoping for a more sophisticated flavor profile anyway. 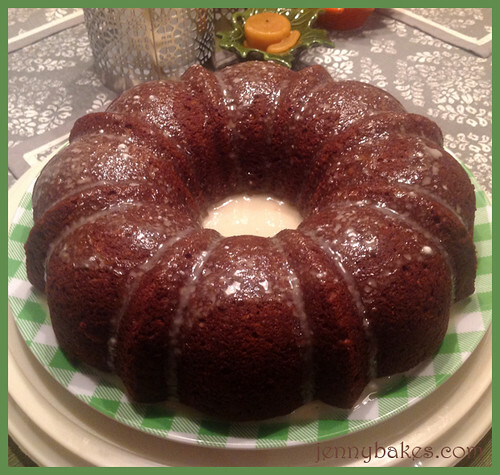 So what is in a Lemon Gingerbread Wonderland Cake? 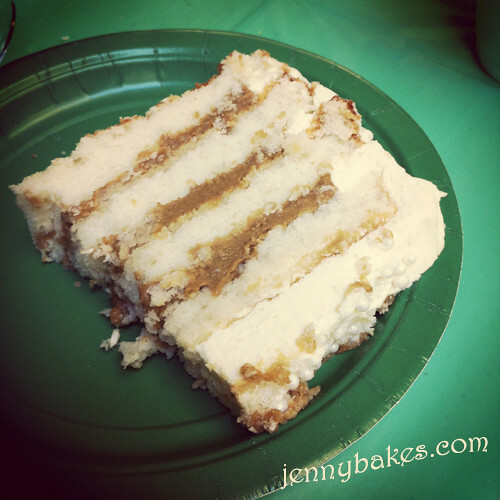 First, I started with Dorie Greenspan's perfect party cake from Baking from My Home to Yours. I made her butter cream recipe as well, which is lightly lemon flavored/scented, and REAL, not powdered sugar sickly sweet. 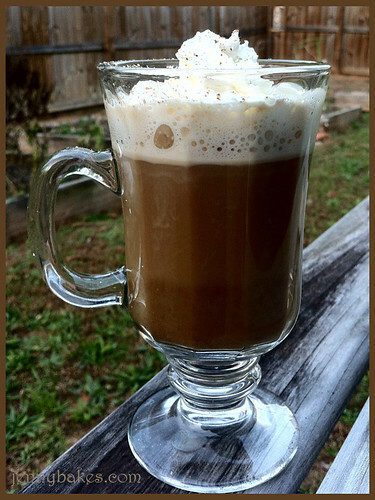 I had run across a recipe for gingerbread latte filling in the Southern Living Pinterest, and couldn't get it out of my head. I'm not sure the recipe is complete. The only sugar in it is 1/3 cup molasses, and it is what had me worried! It makes a custardy pudding type mixture that has to chill overnight (or six hours, which is all I had.) The pictures they use are much darker, and I really do wonder if they left out the sugar ingredient. In the end, it had enough flavor without the sweetness to balance the lemon of the outside. Would I make this again? Probably not. I like ginger and lemon together but would prefer stronger flavors. But I'm just relieved it wasn't as bad as I thought it was going to be, and sometimes that is all you can ask for. Well, hello, caramel, my old nemesis. 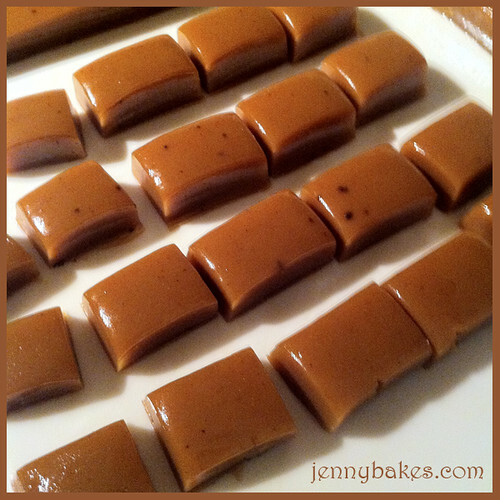 You may have defeated me multiple times in the past, from caramel cake to destroying my oven to failed attempts at caramelized sugar, but as I planned my holiday baking, I came across this recipe for gingerbread caramels. I wanted them. I wanted to bring them to a cookie exchange and feel like I had something to offer. I pledged I would not be defeated. I bought the ingredients over Thanksgiving break, and it took me two weeks to get up the nerve to try the recipe. Once it is poured into the pan, it has to sit untouched for 24 hours, so it has to be timed right. 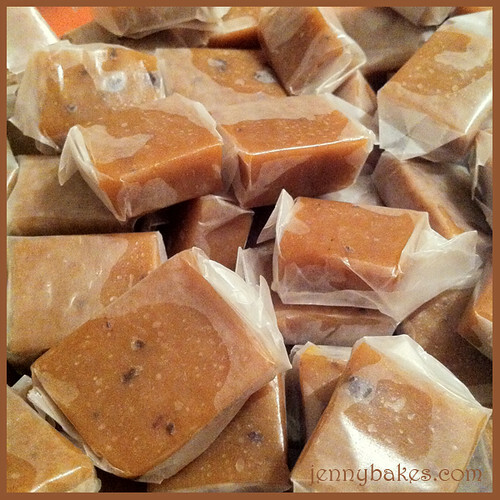 I whipped it up Saturday evening so I could wrap the caramels Sunday evening. Assuming the recipe worked. Assuming I didn't just throw away 2 pints of heavy cream and 2 cups of corn syrup and 4 cups of sugar in the process. After the fudge I made for my students ended up overcooked and dry, I treated my candy thermometer with great skepticism. I went with instinct over the number on the gauge, and the minute the boiling mixture changed to a somewhat stretchy bubbling texture, I pulled it off the heat. This was about 8 degrees less than what Martha told me to look for, but I think I did it at just the right time. I was supposed to mix in the vanilla and spices before pouring the mixture into the pan, and I did, but it didn't mix in very well. In the end, they aren't clumping up enough to make a dusty taste, so I let it go. After 24 hours came the wrapping. And the wrapping. This recipe makes a ton, but it should be enough to bring some to the cookie exchange and give some as gifts. I'll be making this recipe again. I won't be afraid. You should try it too! Although I have several bakery review type posts that I have no reason not to have posted, time is just getting away from me this year. I don't want to neglect to post about holiday treats before the holidays. Every year, I make goodie bags for my student workers in the music library and try to give them out on Study Day, that one day of supposed study time between classes and final exams. Of course, most of my student workers are music majors, so they use that time doing juries, auditions, and interviews for Italy. Busy brains need fuel! This year because we changed how staffing works in the libraries, I have roughly 22 students working shifts in my library instead of the usual 10-11. I should have made slightly less complicated recipes, but I did spread it out over a few days. 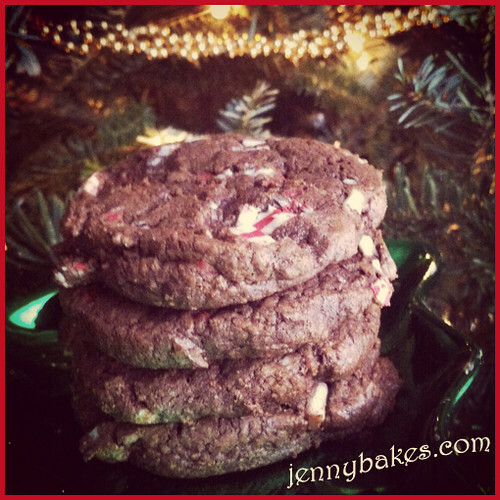 I will post the recipe to the chocolate peppermint cookies soon, I hope, once I've made them again, but for now I'll just describe and link to the recipes I used. Hazelnut Thumbprint Cookies - cookie recipe from Martha Stewart, and I'm making these again for a cookie exchange! Chocolate Fudge - fudge recipe from Alton Brown. Didn't turn out great, wish I'd used a recipe I'd known. 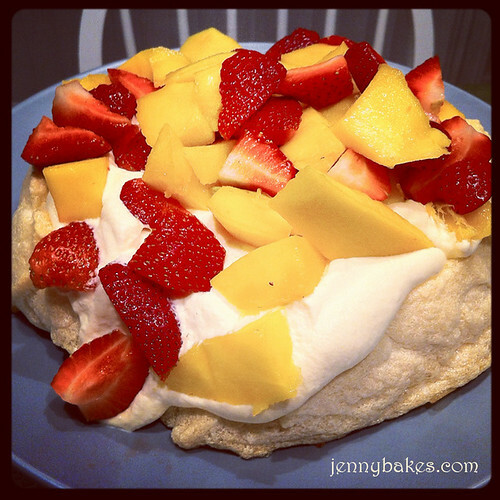 In my attempt to bake around the world this year, I had always intended to make pavlova for New Zealand. I have not yet read my book for New Zealand, but wanted to make something that looked somewhat cloudlike to celebrate the making of one of my favorite books into a film - Cloud Atlas by David Mitchell. A pavlova is a large meringue, baked so that the outside is crisp but the inside remains slightly chewy. It is traditionally served with whipped cream and fresh passion fruit. You can't get fresh passion fruit where I live; it is too fragile and has too short of a shelf life for grocery stores to stock it (I should know, I asked several). I wanted that tart/sweet flavor, so I stalked several ethnic markets to try to find a canned or frozen equivalent. I relied on Alton Brown's recipe, and made a few tweaks as described below. La Unica (Supermercado) had passion fruit nectar which is tasty but would need to be turned into a syrup to be usable in this dessert. They also had frozen passion fruit pulp, without seeds, intended for smoothies. I let some thaw out and stirred it into the freshly whipped cream. My pavlova texture is a little more like sponge (kitchen or dish sponge, not lovely cake sponge) than I would have liked, but I'm 100% confident that is my fault for using Splenda instead of sugar. Sugar really does have certain chemical properties that can't be easily replicated. But I wanted people in my household to eat it. If I were making this dessert for other people, I would just use the sugar. But still - the passion fruit whipped cream, topped with strawberries and mango - amazing and delicious. We ate it after seeing all three hours of Cloud Atlas in the theater, and I was struck by how this dessert represents many geographical areas, just as the book/movie take place in six different time periods. I'll leave you with the preview for the film, in case you have been living under a rock. This is another version of that original strawberry rhubarb crisp recipe I developed, using almond flour, spices and brown sugar splenda instead of the more traditional flour and sugar. 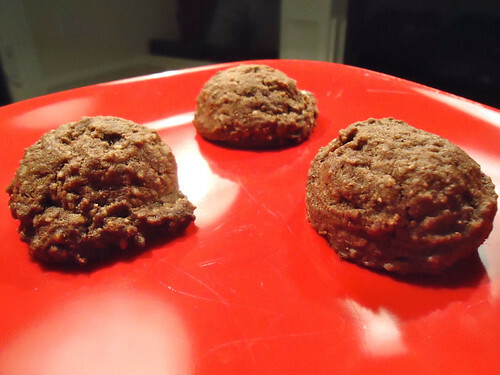 (I didn't add teh flax seed or chickpea flour this time, just used 3/4 cup of almond flour). These apples are Mutsu apples from Justus Orchards in Hendersonville, NC. This time around, I used walnuts and added extra spices to the apples. If I made the apple version again, I would probably cook the apples a bit on the stove, because by the time the top had browned, the apples were still a bit too toothsome for my tastes. 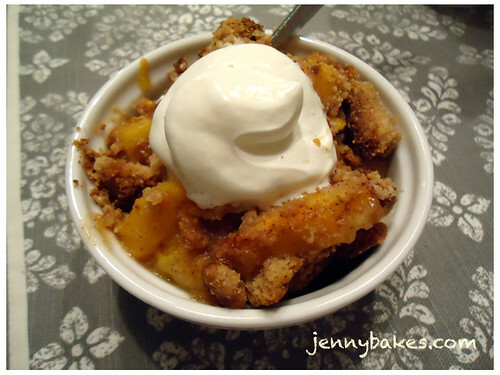 I didn't want the topping to burn, so I took it out before the apples had fully cooked. So if you were making it with apples, either pre-cook the apples or cover the entire thing with foil. 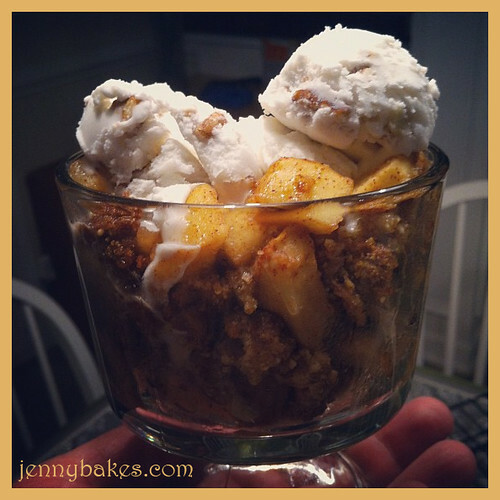 I topped this with the no sugar added butter pecan "frozen dessert" from So Delicious. It is nicest once it starts to melt. Autumn is the hardest season to go without traditional baked goods, and this was warm, spiced, and really hit the spot. Add this to the list of recipes I've discovered through Pinterest! 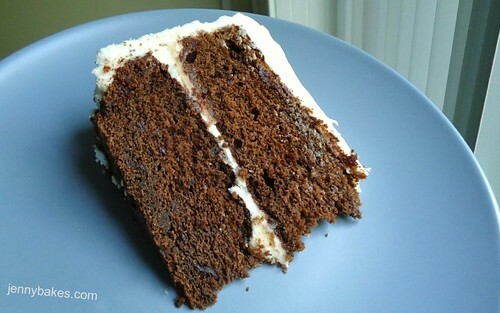 This cake is a lovely combination of pumpkin and molasses, with very little fat since pumpkin replaces most of it. You can find the recipe over on Blommi.com. I whirred the oats in the food processor, but didn't do it finely enough. As a result, this cake had chewy bits that I would have preferred not to have in there. I referred to it as a "breakfast cake," as if that would somehow pardon it. The flavor is superb though! I didn't make the topping as indicated in the original recipe, and just made a simple glaze. 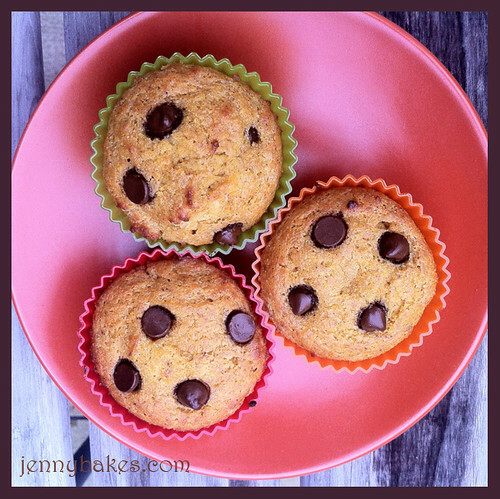 Pinterest has brought me many recipes to try in the past year, and I came across one recently for grain-free pumpkin muffins on the Balanced Bites blog. I modified it and you will find my recipe below, but do check her blog out if you aren't as worried about cutting back on sugar. I've also divided the recipe in half for my small household. Grease half of a standard muffin tray or use six silicon muffin cups. 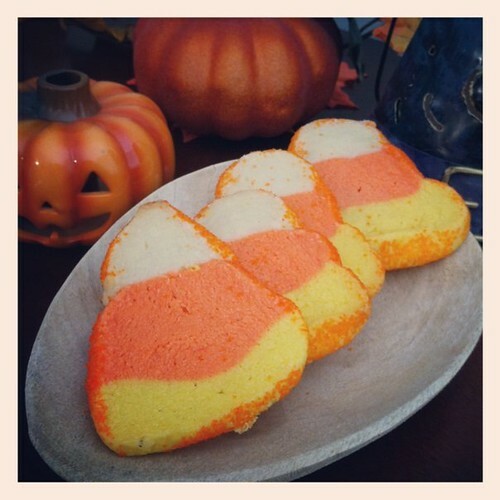 Combine wet ingredients in a large mixing bowl together until well beaten: butter, eggs, vanilla, and pumpkin. Measure dry ingredients (coconut flour, Splenda, baking powder, cinnamon, cloves, allspice/nutmeg) into a bowl and slowly stir into the wet ingredients. 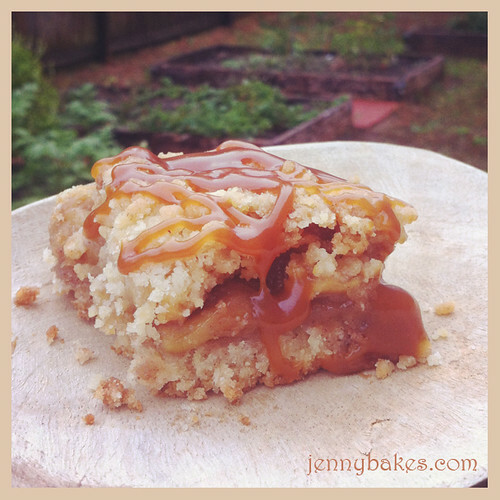 When I saw the recipe for salted caramel apple crumb bars over at Two Peas & Their Pod, I knew they were my destiny for fall. 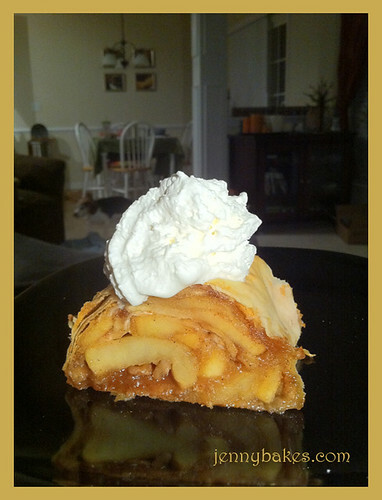 I made this recipe as written, other than using Mutsu apples from Justus Orchard, and it was amazing and delicious. I know that I resisted salted caramel for a long time, but I hereby instruct you NOT to leave out the salt. It changes everything. Without it, these are just super sweet. With it, decadent and fallish. I will make this recipe again! I still exist! I realize I have not blogged since July, but the start of the academic year was the craziest it has ever been. 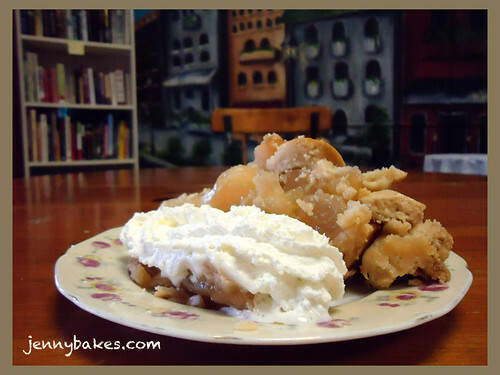 Then when I got apples at the SC Apple Festival, I made my Grandma's apple cake, which I had already blogged. My mutsu apples were getting old, so I knew I needed to bake something this weekend. Today is the first day of fall, so what better day to smell the house up with apples and cinnamon? I have made strudel before; I have even made the dough from scratch. In a pinch, phyllo/filo makes a nice substitute (not quite as tender, but much quicker), and is mercifully low in carbs and calories compared to most pastries. I decided to play with a phyllo apple strudel recipe that I found on Epicurious.com and make it friendlier for the way we're eating these days in my household. I have to say that despite its lower sugar and carb content, this is quite delicious, and a great way to celebrate the first day of fall! Preheat oven to 350 F. Line a baking sheet with parchment paper. Prepare apples and toss with lemon juice. Cook over medium heat with cinnamon and brown sugar Splenda, about 10 minutes or until softened. Remove from heat and let cool while you prepare pastry. Take two sheets Phyllo. Coat with cooking spray and sprinkle with graham cracker crumbs (less than 1 tbsp). Repeat two times. Cover with half the apple mixture. Repeat with remaining 6 sheets of dough (work quickly as the dough dries out!). If using, sprinkle with walnuts. Roll from short end, and brush with melted butter if you choose to use it; if not, coat well with cooking spray. Place both strudels on baking sheet. Slicing before baking is recommended since phyllo bakes pretty crisply, but keep in log shape after slicing. Bake 25 minutes or until golden brown. *One half of a phyllo package will have twice as many sheets, roughly. You might want to double the recipe or add more sheets so as not to waste anything. There were four cracker recipes posted, and I decided to make versions of two of them. The crackers you see above are based on the recipe for "Cheddar and Walnut Icebox Crackers" from The Art and Craft of the Cold Kitchen (3rd ed.). John Wiley and Sons, Inc. Hoboken, NJ: 2008. They are "icebox" crackers because they have butter, and are shaped into logs similar to how many sugar cookie recipes work, then sliced and baked after chilling. 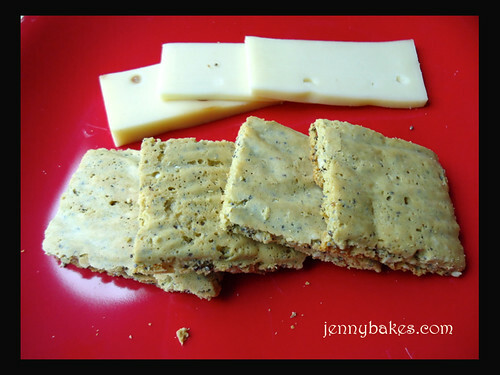 I made them based on what I had in the pantry, so they turned into cheddar, pepita, and rosemary crackers (rosemary from my garden!). 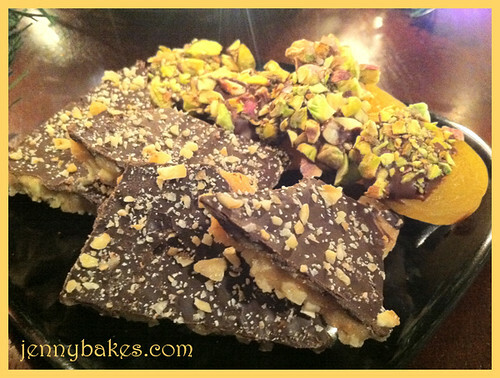 The second recipe is based on Alton Brown's recipe for seedy crisps, only made into a gluten free cracker. I used all chickpea flour, and they feature three kinds of seeds - poppy, sesame, and the recently trendy chia seeds. I didn't set out to include chia seeds, but they jumped into my hands at the Swamp Rabbit Cafe, a local market and cafe featuring organic and local foods. (Anyone with other ideas of what to do with chia should leave a comment to teach me more!). I served the crackers with smoked swiss cheese and homemade chilled tomato soup. It was a lovely light dinner for summer! After the chickpea flour was fairly successful in the crackers, it makes me want to experiment further with other high-protein flours, such as coconut. One day as we were driving through Hendersonville, NC, I noticed two pie places. Two pie places! In one tiny town. I knew I would need to go back and investigate. Is pie the new cupcake? I thought it would be meringues, but those are harder to master. I stopped in at A Piece of the Pie during an afternoon thunderstorm on a very hot and humid day, after having hiked around the historic Carl Sandburg home and spent too much money at several local used bookstores. I wasn't really in the mood for pie, but I was still curious. It is really cute inside - there are homemade goods for sale, including aprons and soap. There are used books everywhere and mismatched furniture. The menu has a wide variety of pies, even for a small town, and the teenagers working the counter also tried to sell me on the homemade icecream. I went for traditional apple pie. The crust was a little salty for me, but possibly a side effect of someone using kosher salt. I actually crunched into it a few times! It was a nice texture other than that. The piece of pie was generous, and there were women in the shop enjoying some of their homemade ice cream. I'd go back! The other pie place was not open on Mondays, so I'll have to report back on that one! 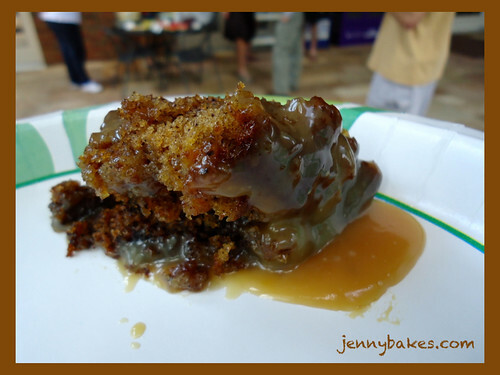 You may not have realized you should be planning an Olympics themed party, but if you had tasted this warm sticky toffee pudding, you would be making up any excuse to bake it again. It was one of those moments where people take a bite and close their eyes in ecstasy. For a silly little traditional English pudding! Hey, the English aren't messing around. I'd had dates and golden syrup in my pantry since Christmas, since I had intended on making sticky toffee pudding for the holidays and just never did. This was so quick to pull together! I used David Lebovitz's recipe, and left out the ginger (mainly because I forgot it), and since I baked it the night before, just didn't make the sauce until the next day. Don't ask about calories. Turn on that opening ceremony and have another bite of sticky! toffee! pudding! Hey, it has fruit in it, that's healthy right? 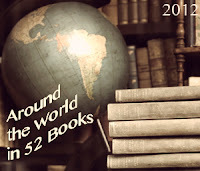 Even though I had already read two books set in Chile for my Around the World reading challenge, when the Around the World in 52 Books group decided on The House of the Spirits as a group read, I decided to participate anyway. I hadn't read anything by Allende before, but I thought I had, probably because she is in the same writing style as Gabriel Garcia Marquez and Luis Alberto Urrea - magical realism, usually following an epic, multi-generational story, largely based on events of historical significance. I would say I enjoyed Allende more than Garcia Marquez but less than Urrea, but I'd still recommend this book. The character of Clara was my favorite. With the assistance of a friend who also had the book in its original Spanish, we discovered something terrible that the translator had done - they tried to Americanize/Anglicize the food! There are several significant events in the book that include descriptions of banquets, but the food sounded very non-Chilean. I know the French and Spanish influence would be strong in Chile, but not to the extreme of not using any native ingredients. And certainly not to the exclusion of dulce de leche. I may not know that much about Chilean cooking, but one thing I can say FOR CERTAIN about South America - they like dulce de leche in desserts! Alfajores are one prime example, where each country has a different name for it, but all are variations of a shortbread cookie with dulce de leche sandwiching it together. There also seem to be many variations of the pastry I present to you - the mil hojas. 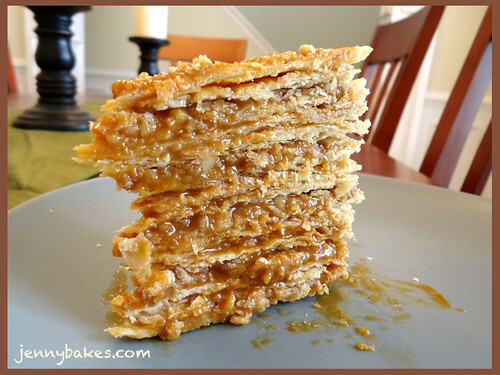 The mil hojas, or "mil hojas de manjar," manjar being the dulce de leche, is some type of flaky pastry layered with dulce. Sometimes it has nuts. Sometimes it is a square. Sometimes it has other ingredients, like regional fruit or whipped fruit. But it always has pastry, and it always has dulce de leche. I came across a great blog called Recipes from South America, and she had several cake recipes involving manjar. I used her recipe for the mil hojas, which she got from her great aunt. Traditional family recipes from Chilean great aunts seemed like just the ticket. Is it really a thousand layers? Well, no. But when you're rolling out each layer into a circle that you are trying to make exactly the same size as all the other circles, it starts to feel like it! The baked circles looked a bit like giant, thin Ritz crackers. There were actually 14 layers of pastry, but we can account for at least 32 layers if we include the dulce de leche between each layer, and ground walnuts added every third. I wish I had taken the time to do something to the outside of the cake. The recipe calls for more dulce to be spread around the sides, but I was using dulce from a squirtbottle and I wasn't sure it was thick enough. I was already oozing dulce out of the layers into a pool on the plate. But because I didn't do anything, the very edges were a bit tough. The edges weren't perfectly even, so I was worried that whatever I did would up making it look ugly. As it is, it just looks sticky. This is definitely a dessert for someone with a sweet tooth, although the walnuts do balance it out quite nicely. By the way. The drink you see in the background of the first picture? That's Chilean iced coffee from the same blog where I got the cake recipe. I took pictures early this morning, but only after zipping to Starbucks for a double shot of espresso to pull it together. So yeah, I had ice cream for breakfast. That's right. Chilean iced coffee has ICE CREAM in it. But the dark espresso makes it not sweet so much as rich. It is easier to pull together than mil hojas, so I'd recommend it! A few months ago, I made a strawberry rhubarb crumble with a lot of modified ingredients that I was pretty happy with. We are already in the thick of peach season right now, so I decided to try coconut flour out in this type of recipe too. I used the same recipe as before, except because I didn't have flaxseed (I'm out! Must remedy this!) I just left it out. I wasn't sure it did anything. I think I was wrong. I think flaxseed brings everything together. This wasn't bad, but I overbaked it a tad and the crumb topping was pretty dense. The flavor was good though, and less savory than when I used half chickpea flour. I've seen coconut flour as an ingredient in many gluten-free recipes, but didn't know a lot about it. Once we tracked some down locally, it was time to experiment! It turns out to be very high in fiber and low in carbs, similar to chickpea flour. 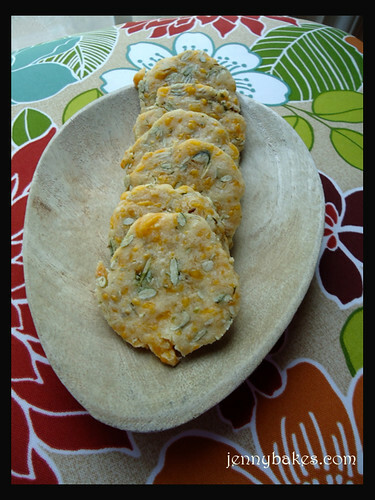 This results in a heavy and dense texture with similar challenges that chickpea flour has. I still wanted to try, because chickpea flour has a very distinct (and strong) flavor that isn't always appropriate in breakfast or dessert situations (and it is a bit stubborn to work with). Like most alternative flours, I have started by making something that is intended to be flat. I found this recipe for "Fluffy Coconut Flour Pancakes" that most of the commenters raved about on the page, and decided to give it a try. 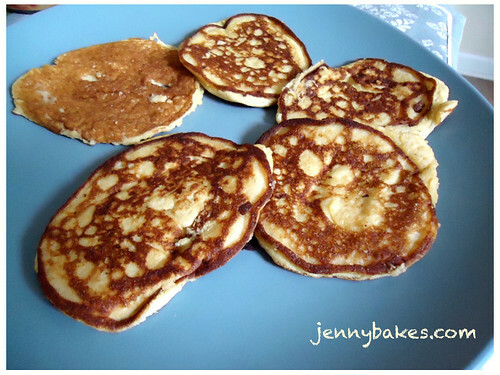 In the picture above, the pancake on the upper left (one of these things is not like the other) is the original recipe. The directions said the batter should be thick and that I'd need to spread it out, but it was really soupy at first. 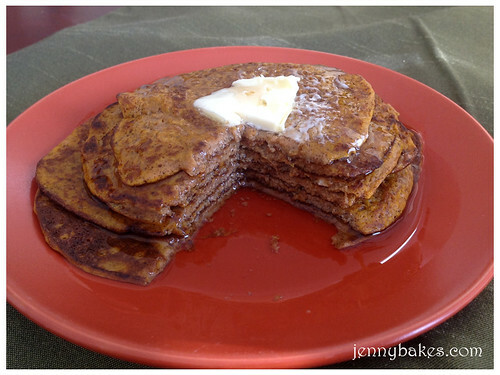 The rest of the pancakes are the result of me adding extra coconut flour until I had an applesauce-thick texture. The funny thing is, the ugly pancake was better in the end, because the others were painfully dense and needed a lot of topping and milk to get them down. Yes we miss fluffy flour-filled pancakes, but not enough to eat something that doesn't swallow easily. When I make these again, I'd shoot for somewhere in the middle. And maybe add some flax seeds since that helps with some of the other recipes I've tried. Flax seeds are frequent in vegan baking too, because they provide the lift and binding of eggs. Of course, this recipe had a lot of eggs in it, so I'm not sure it would help. I'll keep trying and report back. Sometimes a photograph of a cake just can't do it justice. Sometimes how a cake looks can't do it justice. That is definitely the case with this fugly cake. I'll post a picture of it unsliced at the end of this blog entry. I knew I had to make this cake for my birthday. I've had my eye on it ever since the guys over on The Bitten Word made it for Fakesgiving and they said one of their guests almost cried. I put it off and put it off, why? Because a key ingredient of this cake is caramel... sigh. Up until the last minute, I was planning to just use dulce de leche in place of the caramel, but then the canned stuff I know I have seen a million times wasn't on the shelf, so I brought home extra sugar, and decided to just tackle it. I made a few missteps. I made the cake and caramel a day ahead, because the recipe said both could be chilled, and that in fact the cake would be better that way. But I overcooked the caramel a bit (it went to the "dark amber" stage very very quickly, and I think it got all the way to "darkest amber" before I pulled it off the heat), so in the fridge it turned into a taffy texture. Then when I wanted to assemble the cake, I had to warm the caramel back up slightly. Then I put the cake together and the layers did a slow-moving slide to the side. Even though I put it in the fridge, it came out incredibly lopsided. Once I had squished the layers around a bit to get them to be somewhat vertical, and slapped on the icing (including $10 of Ghiradelli semisweet chocolate), it was holding together better. But look at this mess! It is tilting and caramel is EVERYWHERE (I may be finding sticky places in my house for weeks). But how does it taste? Well. Okay. This cake is completely worth any headache. The caramel, especially in the darkest amber stage mine got to, is deep and a little salty (fine, I give in), and is almost like caramel corn. 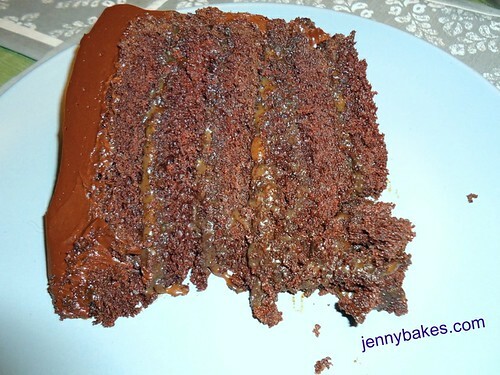 Sandwiched between the layers and left to sit overnight, the cake absorbs some of the caramel. The icing is rich but not too sweet. I couldn't finish the piece I sliced for myself, but I wanted to. So I had another partial slice for breakfast before taking in the leftovers to work. And my co-workers were very happy about eating it. So this little fugly cake is a master of disguise. It is my nemesis wrapped in chocolate cake and enrobed in ganache. And I don't think anyone feels defeated. ETA: Link to recipe for Salted-Caramel Six Layer Chocolate Cake by Martha Stewart. In my many experiments with lower sugar, lower carb baking, I decided to check out a few cookbooks that were recommended in the Living Without Magazine. I ended up with one I didn't request, 1,000 Gluten-Free Recipes by Carol Fenster. Heck, 1,000? I decided to look through it anyway. As in a previous cookbook I reviewed, anything bread or dessert related goes back to a basic flour replacement recipe that the author has developed, a combination of sorghum flour, rice flour, and cornstarch. Those ingredients aren't as lower-carb friendly, so I looked carefully through to find a recipe that would base the flour on something else. I didn't see quite as many along those lines as I was hoping, for instance I don't think there was a single recipe using chickpea flour, but I did come across a few desserts that had other base ingredients. 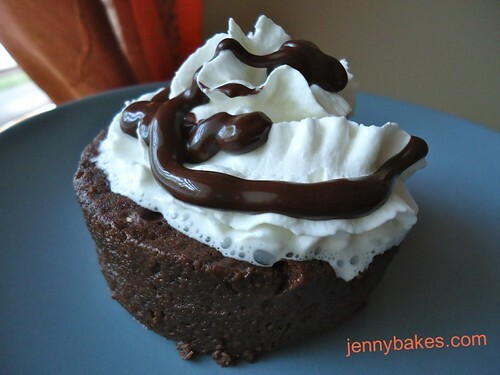 One recipe that intrigued me was for black bean brownies. A co-worker recently had me taste cupcakes she made where garbanzo beans were used in place of flour, and this recipe uses a similar strategy. I decided to make a tweak of the recipe and this is what I'm posting. There was a lot of sugar in the original recipe, so I've tried compensating for that. I also left out the xantham gum, because I thought I had some but didn't. It must have been discarded in the Great Pantry Purge of 2012, when we threw away everything past its date! If you have xantham gum powder sitting around, adding a teaspoon to the recipe will probably do a bit for the texture. I also discovered that my beautiful Cuisinart is broken, but I figured out a way to trick it into thinking it is latched. Sigh. These brownies are very cakey. Please try this recipe! Tweak it and report back! 2 tbsp some kind of liquid (the original recipe had 1/4 cup maple syrup) - soy milk, applesauce, banana, etc. In a food processor, puree black beans, scraping down sides. Pulse in brown sugar Splenda and eggs until smooth. Add remaining ingredients and mix. Pour into prepared 9" pan. Bake at 350 for 20-25 minutes, and cool for another 20. 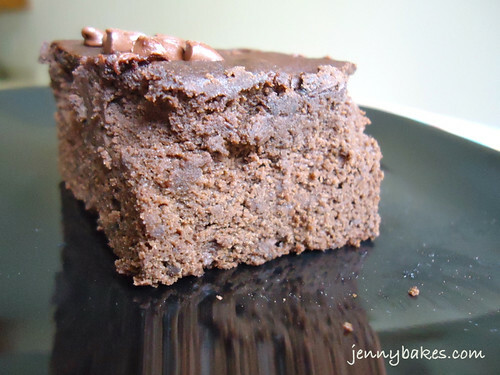 I wish I could shout and say I HAVE FOUND A LOWER CARB CHOCOLATE CAKE AND IT IS DELICIOUS. I'm getting closer, but it isn't there yet. Honestly this attempt was inspired by another post over at Chocolate Covered Katie, which started as a healthy, vegan microwavable chocolate cake. I tried using all chickpea flour instead of regular or spelt, and 2 packets of Splenda for the sugar. Well - 3 tbsp of chickpea flour is not a very dessert-friendly thing. I did bring home some almond flour tonight, and might try going halvsies of each, to see if that helps. I also might try another Splenda packet. Things that are right - the texture. It is very cakey! Yay. Other things that are right - sugar-free whipped cream. Sugar-free chocolate syrup? Ech, skip it. It has a weird lemony taste. I'm still learning, and I thought I'd just share a recipe in process with you. I'm not sure I'll ever believe it to be mine, but rather a variation on Katie's. Also - microwavable, one serving cake? Genius. This is a beautiful book, and a good combination of traditional recipes alongside recipes with twists to them. I loved the bakery and baking blogger features throughout the book, because it connected the recipes to people who bake every day, some of whom were familiar to me. 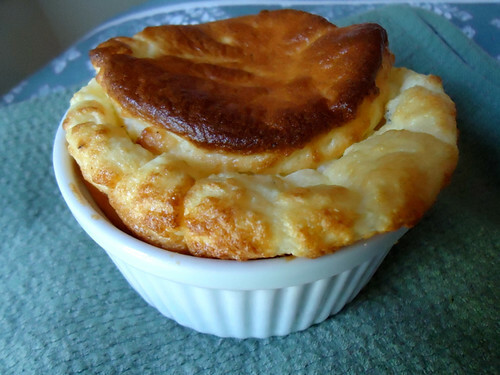 Because I purchased some local goat cheese at the farmers market, I jumped at the chance to make the Savory Goat Cheese Souffles. They were delicious, and I apologize that the picture can't be better because I didn't fully grease the ramekin. My tiny error did not negatively impact the taste! Other recipes I'll try for sure include Pumpkin-Brandy Bread, Hazelnut Streusel Bread, Apricot Pistachio Tart, Dulce de Leche Cake (this is bookmarked for my birthday!! ), Brown Butter Pound Cake with Fresh Fig Compote, and the Figgy Cardamom Bread. The pictures and presentation of the recipes make everything look delicious and appealing. This is probably a great cookbook for less confident baking vegans, because the recipes are detailed and made from ingredients most people would be able to find in an organic grocery store. I was turned off by the number of recipes that just seemed to sub in vegan ingredients (heavily relying on vegan margarine and vegan cream cheese), without looking more outside the box and using ingredients that stand alone without trying to be something else. The lack of coconut products makes the recipes feel dated, and everything contains refined sugar, which surprised me as many vegans don't believe in using it. I know this baker won Cupcake Wars on Food Network, but the recipe I tested (Seoul Choco Balls) resulted in dry and crumbly cookies, after I spent $8 on macadamia nuts, phew. I think I'd focus more on the cake and cupcake recipes, since that is more what she is known for. Before I introduce you to my latest cake experiment, please take a blog-reading break and enjoy this song. (Trust me, you might need it). Okay, you can push play and then keep reading. Ready? Kasia, a friend of mine who also has a food blog (Kasia's Kitchen), has raved about Joy the Baker for years. One day she pointed me to this Chocolate Beet Cake recipe and begged me to try it, to see if it really worked or tasted good. I bookmarked it (pinned it, really, since I now keep track of recipes I want to try in Pinterest) and then bought beets with no plan at the farmer's market. I can't be the only person who does that... buys vegetables without a plan. After all, that pushed me into using fennel for the first time and planting a jalapeno pepper in my garden. 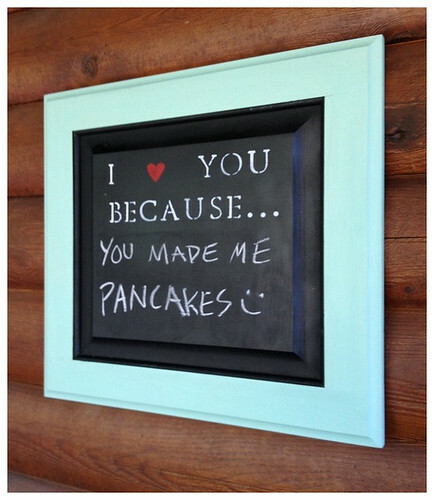 But most of the time, I don't think to add them to cakes. Okay, except for squash and green tomatoes and carrots. I take it back. Vegetables belong in baked goods! Still, this is my first experience baking with beets. I'm actually new to liking beets in general. I had canned pickled beets for years as my only exposure to the vegetable, and wasn't a huge fan. One year while we still lived in Indiana, we had a nice dinner at the Wolfgang Puck restaurant at the Indianapolis Museum of Art (it appears to have been replaced by something else). I ordered a roasted beet salad, which ended up being little solitary stacks of roasted beet, goat cheese, and beet chip - and it was delicious. Ever since, I've been a little more curious about them. I even make a salad with beets, field peas, and goat cheese. This is why I bought the beets in the first place! I am getting way off track here. Hi. 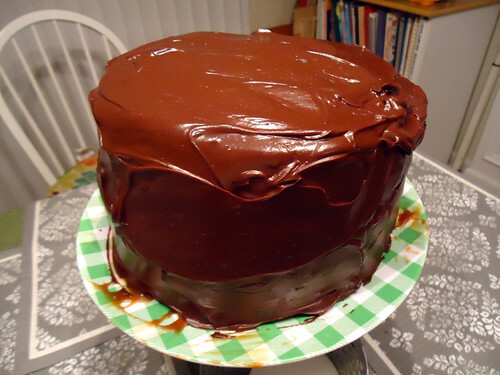 This is a picture of the chocolate beet cake that I made, and it was delicious - dense in a good way, and very moist. 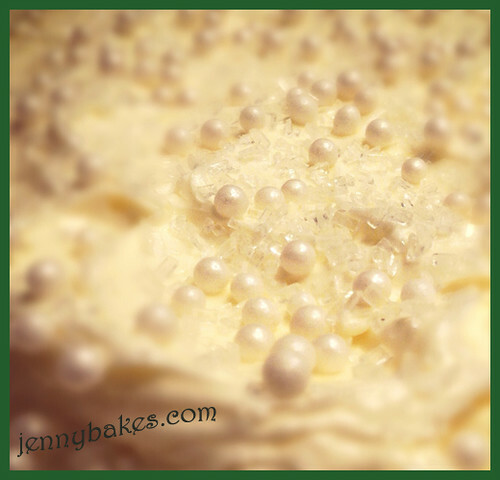 The recipe lives over at Joy the Baker, so please pay her a visit and try making this amazing cake. Her pictures are gorgeous, because she also added beets to the icing. After reading her comment about beet strands, I elected not to do the same, which probably got more people to try the cake, but in the end I think I would have enjoyed the extra flavor layer of beets. One thing I did wrong, and you can kind of see it in this picture - I used the largest grater I had instead of the smallest. Since you don't puree the beets, the finer they are grated, the more even in texture the cake will be. That's something I'll do differently next time. And there will be a next time. Because I received a copy of this from the publisher, I am reviewing it the same week it comes out! While I was given a copy for free, I wasn't asked for anything (nor did I ask for a copy! ), so these are my honest thoughts. Anyone who knows my feelings on memoirs should understand that four stars is no slight praise for Alyssa Shelasky. After all, I almost gave up in chapter 2, which I will refer to as the "name dropping chapter," where she talks about her days (more often: nights) as a writer for various well-known TV networks and fashion/entertainment magazines in New York. It is shallow, it is silly, and I found her incredibly annoying. Without that contrast, I think you wouldn't get a chance to understand how she grows. Alyssa had a relationship with a fairly known 'celebrity' chef (I'll let you Google it since in the book she refers to him as Chef), one taking her from her comfort zone and dumping her into a solitary existence in DC as he rode the swell of fame to opening several restaurants. It is an isolation that anyone living with a restaurant person would know well. She has to go through a journey to find herself, to find happiness but also just a hobby, and food becomes her salvation. The fact that she'd never cooked in her life makes the story more charming, and it helps that she has no problem making public mistakes. 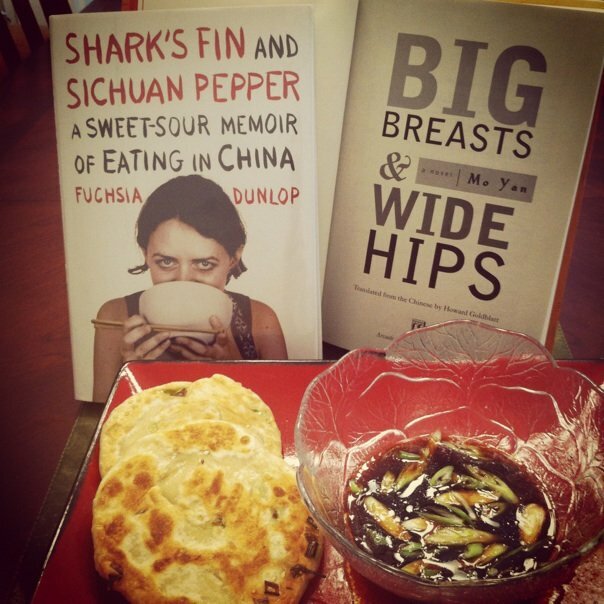 It started with her blog, Apron Anxiety, and turned into this book. I don't often laugh when I'm reading, but her description of her first meal for Chef had me giggling. It isn't just that she learns about food. Any tedious journalism major could go through that journey, and the potential for an inauthentic experience is what I was fearing when I started the book. I felt her personal journey to be far less shallow than she appeared toward the beginning, and she learned to get to know people who she had originally dismissed, and to stand up for what she needed from her life. There are recipes throughout this that make for a feel-good read, as if the reader could recreate moments that were meaningful for the author. And... yeah, I might need to make that tomato soup. "You learn that there's nothing bad about feeling safe and there's everything good about inner stillness; and above all, just because you're an extraordinary person who deserves extraordinary love, it can't come at the expense of everything else that makes you whole." "Everyone cooks for matters of the heart. We're all in the kitchen because it fulfills a longing inside, whether it's for grace, survival, a renewed sense of self, or just the thrill of it all - these are the stories that get us there, keep us there, or sometimes take us away. But without the people who have moved us, pushed us, left us, maybe even hurt us, then really, it's only food." I'm finally getting back to baking items for my Around the World challenge! Back in February, I read The Yacoubian Building by Alaa Al Aswany (you can see my review here). The main character in this book set in Egypt is the building, but one of the people moving throughout the story is Zaki Bey, who has interesting ideas about women. One of them includes how they pronounce the S in basbousa! 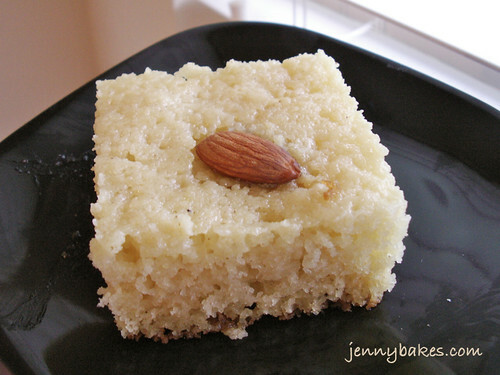 Basbousa is a relatively simple cake, made with semolina or sometimes farina. I hunted down farina for this recipe, which is why mine is fairly pale (semolina would be more like a corn bread). While the cake is still hot, it is covered with a lemon-honey syrup that soaks in. The cake is dense and not too sweet, but still tasty. 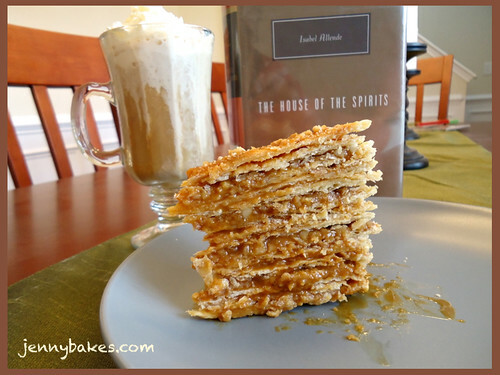 I enjoyed Jessie Oleson's personal basbousa story over on Cakespy, and used her recipe for Brooklyn Basbousa. 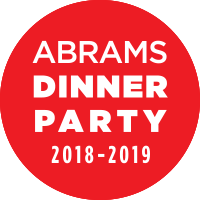 Please check it out and whip up a pan!